No7 Beautiful skin hot cloth Cleanser. Brand New Unopened. Comes from smoke and pet free home. Please can the winning bidder pay within two days of the auction ending. Please look at my other items for sale. Boots No 7 Radient Results Revitalising Hot Cloth Cleanser. Suitable for sensitive skin. Easiest and healthier looking energised skin. 200ml It has been used a handful of times. Dispatched with Royal Mail 2nd Class. No7 Hot Cloth Cleanser Radiant Results No 7 Size 200ml with Muslin face cloth. Condition is Brand New and Unopened. Original Formulation of the Cleanser. A light refreshing lotion, that cleverly dissolves make-up and impurities, to help keep skin looking clear and healthy. Works in one simple step, leaving no residue, just perfectly clean, supple skin. No7 Hot Cloth Cleanser Radiant Results 1x200ml Boots/Facial/Face/Original/NEW . Condition is New. Dispatched with Royal Mail 2nd Class. Formulated with No7’s Tri-Vit Complex Grapeseed Oil. Cleanse your way to radiant & healthier looking skin in 1 week. Created to help your dry skin behave like normal skin. Providing tailored skin nutrition for healthy looking, bright and beautiful skin. A light refreshing lotion, that cleverly dissolves make-up and impurities, to help keep skin looking clear and healthy. A refreshing gel that transforms into an oil as you massage into your skin. Cleverly dissolves make up and impurities to help skin looking clear. It then transforms into a milk as you rinse clean leaving no residue. Beautiful Skin Hot Cloth Cleanser. Type Cleanser. Skin Type All Skin Types. For All Skin Types. No7 Radiant Results Revitalising Hot Cloth Cleanser. 2 BONUS No7 Muslin Face Cloth's Included. Formulated with No7’s Tri-Vit Complex Red Ginseng. The indulgent, creamy formulation effortlessly removes make-up, impurities and pollutants, while the gentle exfoliating muslin cloth polishes away dead skin cells and smoothes skin. No7 Radiant Results Revitalising Toning Water. A multi-tasking toning water to help prepare the skin after cleansing. Leaves skin looking renewed, and feeling toned, soft, and revitalized. Formulated with No7s Tri-Vit Complex Red Ginseng. No7 Beautiful Skin Micellar Cleansing Water works in one quick, easy step, leaving you with perfectly clean, healthy looking skin that feels fresh and hydrated. Removes even waterproof and long lasting make-up. (Bag worth £7). Bag will automatically be added to your order. 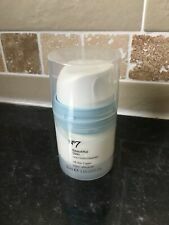 Boots No7 Beautiful Skin Hot Cloth Cleanser 200ml with muslin cloth. For all skin types, for soft hydrated and radiantly clean skin. New and boxed. Formulated with the No7 Tri-Vit Complex Red Ginseng. Close your eyes and massage over dry skin in upward circular motions. Run the muslin cloth under comfortably hot water, wring out the excess water, and place the cloth over your face to open pores. Formulated with No7’s Tri-Vit Complex Red Ginseng. A light and fresh cleanser that transforms into a soft, creamy foam to gently remove make-up, impurities and pollutants. Leaves skin feeling thoroughly cleansed, soft and revitalised.